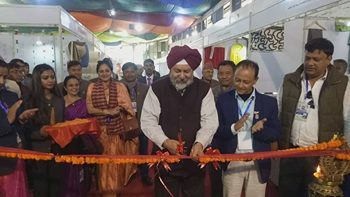 Indian Ambassador to Nepal Manjeev Singh Puri inaugurated India Pavilion at 16th Handicraft Trade Fair in Kathmandu on Thursday. Mr. Puri said handicrafts bind India and Nepal. He said handicraft sector is developing in Nepal not only by keeping traditional ethos and values but also going to new areas. The five-day fair is organised by the Federation of Handicraft Associations of Nepal (FHAN) and Govt of Nepal. Various handicraft products, arts & crafts, gift and decorative articles and potteries have been showcased on more than 200 stalls. The main objective of the fair is to promote handicrafts and provide a common platform to local exporters, producers, foreign buyers and sellers of handicrafts.